ONE-STOP-SHOPPING FOR EVERYONE WHO NEEDS NOTHING! ORDER NOW! Click on the product for more information. You will be taken to www.kazoos.com where you can make your secure purchase. For bulk, special or custom orders, we offer discounts. Please call 1-800-326-0358 and mention Barbara Stewart Custom Kazoos. Note: 100% of proceeds go to The Share Arts Foundation. Click here for more information on Share Arts, a NYS not-for profit group that promotes interest and education in the performing arts for audiences of all ages. 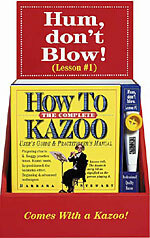 Buy the best kazoo book ever, The Complete How to Kazoo: User's Guide and Practitioner's Manual. Perfect gift book for absolutely everyone. If you can talk, sing, or hum, you can kazoo. Fun ideas, marching band directions, practice tunes, history of this uniquely American instrument and its African roots—everything under the sun about kazooing. Appropriate for all ages. Packaged with a free professional model kazoo. 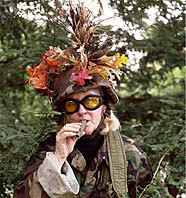 "No person, no matter how obsessive, will ever surpass Barbara Stewart in the how-to-kazoo field. Her achievement is more durable than Bob Beamon’s long jump record in Mexico City in 1968. Every page of this thoroughly new edition is strewn with gems of humor and musicology." Learn the proper technique from Master Kazooist, Barbara Stewart, author of The Complete How to Kazoo User's Guide. Kazoophony’s How to Kazoo CD™ demonstrates techniques from the book. Buy both the CD and book for your kazoo band, club or gathering. 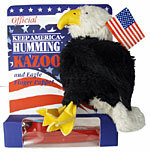 The Official Keep America Humming Kazoo: (Eagle Puppet + Kazoo). We have a National Bird, why not a National Instrument?!? Raise your voice to support our campaign to make the kazoo the national instrument with this special custom-made kazoo. Tired of the ‘ribbons’? Support our campaign with this unique shape: the kazoo. 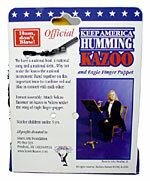 Join our mission to make the kazoo the national instrument, to “Keep America Humming”. Put this on your car or fridge to show solidarity for the greatest cause of all—freedom of expression. You will never misplace your kazoo when is attached to your hat! Play when you want. Take it to ‘the game’ or to other outings. Supports our mission to “Keep America Humming”. HOT ITEM for election year! Our mission is to make the Kazoo the national instrument. Hum to your own tune while sporting this shirt—lots of causes, but nothing like this one! Note: the Kazoo is not affiliated with any political party so you are safe to wear it to any and all political events! Adult: Sm Med, L, X-L and 2X-L. This revolutionary new rock formation breaks through soundless barriers to create the hottest and most appreciated new kazoo genre—Zed Rock™. Take a rest from worldly noise. 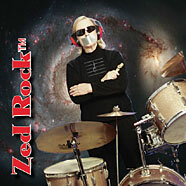 Be a Zedhead™ with Zed Rocker Barbara Stewart. Arranged for Tacit Kazoo, Air Guitar and Untouched Percussion. Photo by John Menihan, Jr. The Academic Tee for kazoo aficionados. Limited Edition, suitable for those who have trained and deserve credit. Before going public, perfect the art of kazooing in secret. Use your camouflaged Stealth Kazoo™ to remain undiscovered, until you reach desired level of expertise. Comes with a solid black, lead-free Kazoobie kazoo with two color camouflage imprint. High quality black lanyard attaches to the end of your kazoo to prevent loss in enemy territory. COMING SOON FOR 2007 HOLIDAY SEASON! Hang up, or hang out with your friends and family!!! 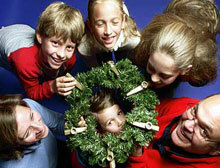 Kazoo the holidays away!!! Home and Garden Craft Project that comes complete with red kazoos, bow and ready-to-hang wreath that allows you to affix your own kazoos (and play with the rest of them). To provide easy access for ensemble playing, face kazoo mouthpieces outward. Buy “Keep America Humming” Kazoos in variety of colors, with Lanyard (necklace). Customize your own kazoo with your name, club, group, company name, pseudonym. Buy in bulk for best price. We offer discounts. Please call 1-800-326-0358 and mention Barbara Stewart Custom Kazoos. Note: 100% of proceeds go The Share Arts Foundation. Click here for more information on Share Arts, a NYS not-for profit group that promotes interest and education in the performing arts for audiences of all ages.